For good reason the German theatre was to be the important one for 1796. Bonaparte changed that in Italy but that didn't render events in Germany irrelevant. A Map showing the starting positions of the armies as of Spring 1796. The year 1796 opened with France safe and ready to go on the offensive. The Dutch, Prussians, Northern Germans and Spanish had all left the war. At the time it seemed obvious that the main effort would be in Germany. 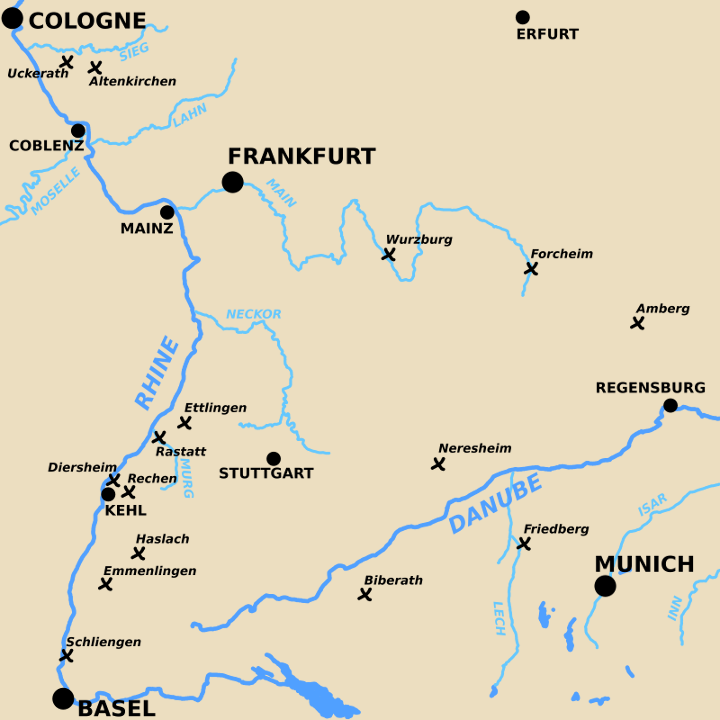 The direct route to Austria lay across the upper Rhine, through the Black Forest and down the Danube valley to Vienna. Moreau's Army of the Rhine and Moselle was positioned to take this route. It faced an Austrian Army commanded by Wurmser. On the lower Rhine Jourdan's Army of the Sambre and Meuse was positioned to attack into the Main valley thus flanking the Austrians and Germans to the south. Directly facing Jourdan were forces commanded by the Archduke Charles. To the south Kellerman's small army of the Alps held the direct mountain passes to Italy. It was hoped the decrepit Army of Italy slightly refurbished and with the energetic Bonapart replacing the discouraged Scherer would be successful enough to provide a worthwhile distraction from the main show. Bonaparte himself audacious and ambitious to emulate Hannibul, Ceasar and Alexander rationally only had hopes to knock Piedmont out of the war. Just reaching the rich plains of northern Italy and freeing his army from the dearth it suffered squeezed between the mountains and sea of the Riveria would be a great achievment. In his best case he hoped to push the Austrians entirely out of Italy. The directory's ambitious plans for their armies to drive all before them uniting before the gates of Vienna aside, the eventual result where the war was won in Italy culminating in an unsupported attack across the Alps against Vienna was a result no professional military man would have anticipated. In some ways the war in Germany is more revealing of the actual situation at the time then the products of Bonaparte's genius in Italy and therefore worth more study. Certainly more study than it usually gets. Exact figures for the effective forces involved in the 1796 campaign are not reliable. Desertion, illness, and detachments render all figures liable to interpretation. The revolutionary French likely did not know their own numbers exactly at any one time. The Austrian's might have but weren't inclined to sharing military information with the public. A map showing Battles in Southern Germany in 1796 and 1797. Bonaparte's offensive opened in early April and within a few weeks had knocked Piedmont out of the war. Jourdan went next. With the expiry of a temporary armstice the Army of the Sambre and the Meuse moved forward on the 31st of May. A series of clashes began with First Battle of Altenkirchen on the 4th of June 1796. The Austrians under Wurttemberg were pushed back. The Archduke Charles marched from the middle Rhineland to Wurttemburgs aid. On the 19th of June he gave battle at Ukerath. This rearguard action showed the French that the Austrians were capable of putting up a hard fight. Nevertheless the still outnumbered Imperial troops were forced to continue their retreat. Early in June Wurmser and 30,000 men from the Army of the Upper Rhine were dispatched to Italy as a result of the loss of Piedmont and Milan. This fatally weakened the Allied position on the upper Rhine. Letour replaced Wurmser in command there. Moreau's Army joined the offensive with a crossing the Rhine near Kehl on the 24th of June. The battle of Kinzig (Rechen) on the 28th June 1796 saw the Allies pushed back. The Archduke Charles was forced to march to Latour's assistence with 25,000 men and so the situation on the lower Rhine once again swung in the French favor despite the Archduke's successes there. Moreau's army continued pushing back the Austrians in a whole series of battles beginning with Rastatt on the 5th July 1796. Followed by Ettlingen (Malsch) on the 9th July 1796. The Austrians outnumbered despite having been reinforced by the Archduke by this point were defeated. Their position on the upper Rhine became untenable. The battle of Haslach on the 14th July 1796 was a rearguard action to the south of the main forces. It was an attempt to deny the French the passage of the Black Forest's rough terrain. It failed. The Allies both north and south of Kehl retreated back to the Danube abandoning the south Germans of the upper Rhine and Swabia. Stuttgart fell on the 17th of July. In the north Jourdan's Army of the Sambre and Meuse had counter attacked. Frankfurt the main Austrian supply base capitulated on the 15th of July. The Allies now outnumbered almost two to one were in full retreat there too. Jourdan kept the pressure on in the north with the battle of Forcheim on the 7th August 1796. The French surge lasted until Neresheim on the 11th of August 1796. It wasn't stopped there but it was slowed. The battle was close enough to a draw to allow Charles to disengage from Moreau and move north against Jourdan. The remaining Allied forces in the south suffered another defeat at Friedberg on the 24th August. Charles, however, was able to check and defeat Jourdan at Amberg also on the 24th August 1796. The results of Amberg were sealed at Wurzberg on the 3rd of September 1796 where the retreating French under Jourdan were mauled. Moreau forced to retreat by Jourdan's failure countered attacked at Biberach on the 2nd of October 1796 with some success, but only bought space for a less disasterous withdrawal. The Austrians continued to press their advantage against Moreau at Emmendlingen (or Emmendingen) which was fought on the 19th October 1796. Finally Moreau's retreat and the Austrian pursuit ended at Schliengen on the 23rd of October 1796. The French had been beaten back but managed to stablize the situation. All of Archduke Charles successes in Germany were rendered moot by Bonaparte's in Italy. The Archduke was sent south to attempt to retreive the situation. And so 1797 saw the French in Germany attacking again. Jourdan went first winning the battle of Second Battle of Altenkirchen on the 18th of April 1797. Moreau vastly superior in numbers to the forces facing him got his licks in at Diersham on the 20th of April 1797. Finally the overstreched Bonaparte brought an end to hostilities in April by upsurping his government's authority and negotiating directly with the Austrians whose capital he appeared to be threatening. 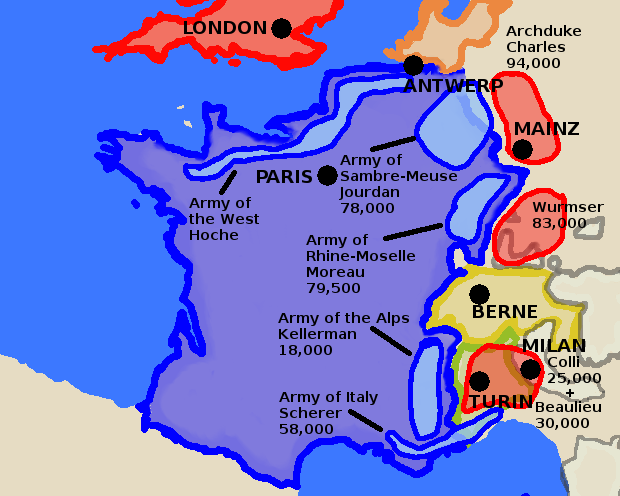 The French in 1796 and 1797 overestimated their strength. In fact they were not superior in numbers, or except for Bonaparte in generalship to the Allies. If Italy had remained the expected sideshow they would have likely have managed at best an unsustainable stalemate on the Rhine. Only the loss of half of the German forces and their best generals to the Italian theatre allowed Jourdan and Moreau what success they had. In the end even with the advantage of Bonaparte's brilliant Italian campaign Jourdan and Moreau dithered away the chance for decisive success in Germany. Note: You will need to cut and paste addresses given into your browser's address line in order to follow them. also known as "The West Point Atlas"
Originally published in 1942 (in London by Collins) and having gone through 78 editions up to 1985 according to WorldCat this work is clearly inspired by the time it was written casting Britain as a lonely hold out against a monsterous and overbearing continental tyranny that it only relunctantly and belately went to war against. Good from an English politics point of view it is distinctly Anglo centric and conservative in tone. Hardcover and Paperback versions listed as published by Routledge as of August 2018 on Amazon, but front matter has copyright date of 2019 and Taylor & Francis in London and Routledge in New York. This book is expensive. Also shorter and more high level than one might hope for. Still a very solid professional overview written in a manner accessible to a wider audience. Probably one of the best starting points if you're serious about learning about the period but are new to it. Note American editions may be abridged and may have edited sections relating to American involvement especially as regards war of 1812.